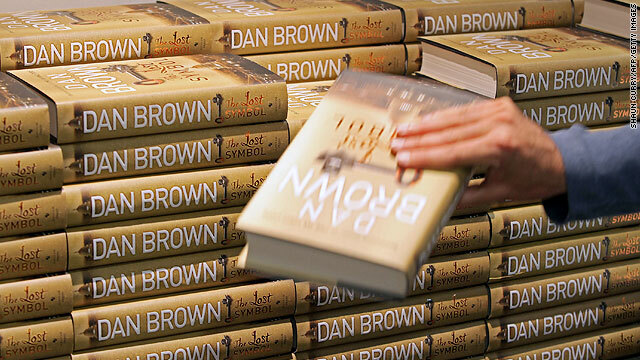 Dan Brown's "The Lost Symbol" was downloaded for free more than 100,000 times within its first days on sale. (CNN) -- When Dan Brown's blockbuster novel "The Lost Symbol" hit stores in September, it may have offered a peek at the future of bookselling. On Amazon.com, the book sold more digital copies for the Kindle e-reader in its first few days than hardback editions. This was seen as something of a paradigm shift in the publishing industry, but it also may have come at a cost. Less than 24 hours after its release, pirated digital copies of the novel were found on file-sharing sites such as Rapidshare and BitTorrent. Within days, it had been downloaded for free more than 100,000 times. Digital piracy, long confined to music and movies, is spreading to books. And as electronic reading devices such as Amazon's Kindle, the Sony Reader, Barnes & Noble's Nook, smartphones and Apple's much-anticipated "tablet" boost demand for e-books, experts say the problem may only get worse. "It's fair to say that piracy of e-books is exploding," said Albert Greco, an industry expert and professor of marketing at Fordham University. Sales for digital books in the second quarter of 2009 totaled almost $37 million. That's more than three times the total for the same three months in 2008, according to the Association of American Publishers (AAP). Statistics are hard to come by, and many publishers are reluctant to discuss the subject for fear of encouraging more illegal downloads. But digital theft may pose a big headache in 2010 for the slumping publishing industry, which relies increasingly on electronic reading devices and e-books to stimulate sales. "Piracy is a serious issue for publishers," said Hachette Book Group in a statement. The company that publishes Stephenie Meyer's wildly popular "Twilight" teen-vampire series says it "considers copyright protection to be of paramount importance." Authors are concerned as well. "I'd be really worried if I were Stephen King or James Patterson or a really big bestseller that when their books become completely digitized, how easy it's going to be to pirate them," said novelist and poet Sherman Alexie on Stephen Colbert's show last month. "With the open-source culture on the Internet, the idea of ownership -- of artistic ownership -- goes away," Alexie added. "It terrifies me." And it's not just bestsellers that are targeted by thieves. "Textbooks are frequently pirated, but so are many other categories," said Ed McCoyd, director of digital policy at AAP. "We see piracy of professional content, such as medical books and technical guides; we see a lot of general fiction and non-fiction. So it really runs the gamut." Piracy of digital music, thanks to Napster and other file-sharing sites, has been a threat to recording companies for more than a decade. Over the years, the record companies tried different approaches to combat illegal downloading, from shutting down Web sites to encrypting songs with digital-rights management software to suing individual file-sharers. Although illegal file-sharing of music persists, Apple's online iTunes store is now the world's biggest seller of music. To some industry observers, this may be where the future of the book industry is heading as well. But talk to publishers and authors about what can be done to combat e-book piracy, and you'll get a wide range of opinions. Some publishers may try to minimize theft by delaying releases of e-books for several weeks after physical copies go on sale. Simon & Schuster recently did just that with Stephen King's novel, "Under the Dome," although the publisher says the decision was made to prevent cheaper e-versions from cannibalizing hardcover sales. Some authors have even gone as far as to shrug off e-book technology altogether. J.K Rowling has thus far refused to make any of her Harry Potter books available digitally because of piracy fears and a desire to see readers experience her books in print. However, some evidence suggests that authors' and publishers' claims of damage from illegal piracy may be overstated. Recent statistics have shown that consumers who purchase an e-reader buy more books than those who stick with traditional bound volumes. Amazon reports that Kindle owners buy, on average, 3.1 times as many books on the site as other customers. Ana Maria Allessi, publisher for Harper Media at HarperCollins, told CNN, "we have to be vigilant in our punishment ... but much more attractive is to simply make the technology better, legally." E-book technology offers so many positives for both the author and the consumer that any revenue lost to piracy may just be a necessary evil, she said. "Consumers who invest in one of these dedicated e-book readers tend to load it up and read more," said Allessi. "And what's wrong with that?"